There is, in the mapping world, a form called the typographic map. Words are wrought into geographic shapes they name or describe. The meaning of the word and its shape, and the relationship between the two, are key to understanding this map of words. 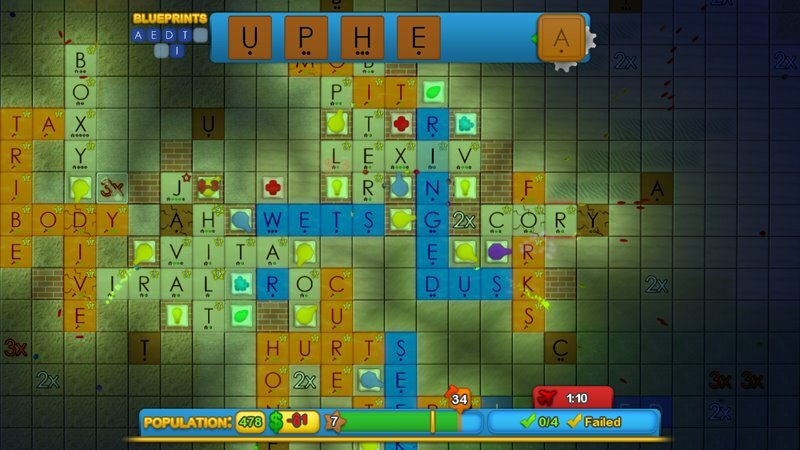 Andrew Gaubatz’s Lexiv, which combines Scrabble and Sim City and tower defense and RPG leveling and slot machines and Breakout, is about building a map of words. Sort of. Like Scrabble, Lexiv doesn’t concern itself with what a word means. In Lexiv, how a word means – its part of speech – is what matters. The dictionary is a limiter, a way to give form to board management and point maximization. Your vocabulary is a resource, but not necessarily the most important one – like most digital versions of Scrabble-with-Friends, Lexiv doesn’t let you build a word not in its dictionary. There are no turns, just a game clock and steady production of letters (they fade in on a blank block so you know what’s coming next). It helps the game avoid the problem Garrett encountered in yesterday’s Quarrel review: you’re almost never in a situation where a few seconds matter, so having to cycle through the letters isn’t a hindrance. They’re stored in a “dock”, a Scrabble rack, and you use them to build words on a grid in a number of different scenarios. Sometimes you’re trying to build your city to a certain level; sometimes you have to survive a certain amount of time while being attacked by waves of invaders; sometimes you’re building words of a certain length or on specific squares. Victory conditions are listed before you start a scenario, and you’ll always know thanks to a “DANGER!” warning if your city is in danger of being attacked during it. You solve common city-simulation problems, but knowledge of economic theories is replaced by vocabulary: address homelessness by building more nouns, unemployment by building more verbs. Or you can use adjectives or adverbs to increase the quality of your already-existent nouns or verbs (the “Etc” category covers other parts of speech, like interjections that boost both nouns and verbs – though the game’s word-sorting is sometimes questionable). Once a noun or verb has been affected by a modifying word, the citizens of its letters will demand you provide them with services. It takes both to boost a letter’s value. Fortunately, your citizens are not picky. They just want a combination of four essential services: health care, energy, recreation, and education. Building a service costs a few dollars and takes up one of the grid squares. Services (and, in Danger! scenarios, turrets) affect a circular area. No worries about building roads to connect services to people: in Lexiv, there is no infrastructure. This setup makes dense Lexiv cities easier to defend and service: build one on an empty square amid a bunch of tightly organized words and its efficiency is reward for your efficiency in planning. There’s a trade-off, though. Build densely and you’ll be able to more easily protect and service your city, but risk not having enough room to build your city’s level faster than the rising “unhappiness” meter. If that meter reaches the end of your experience bar before your city levels up, citizens begin moving out of your city. Reach a population of zero and you lose the scenario. At each new city level you choose between two bonuses. There’s no persistence of city levels across scenarios, so you’ll have plenty of chances to try the lower-level bonuses. There’s a second layer of leveling: scenarios earn you XP that increases your player rank. Each rank provides you with a rank bonus (these persist across all scenarios and the game’s Breakout-clone credits, which awards you XP for finishing its multiple screens). And on top of that, as you rank up you unlock more perk slots. Perks are awarded for completing scenario objectives, usually via a slot machine that transforms your objectives into spins; your total points translates to a perk. It’s bright primary colors give it a Fisher Price’s My First Game feel. But it’s an exciting kind of My First Game: like a young filmmaker or novelist (Graubatz is a student at the University of Virginia) whose early work is packed with ideas not fully realized, Lexiv has an energy about it. Like at any minute, one part could give and the whole thing could come crashing down. But it doesn’t. It should be a mess, but it works. And that’s great.